At around 9am we landed in Amsterdam. Was quite an emotional moment to realise it was all real. We were so exhausted after 2 days of travelling. 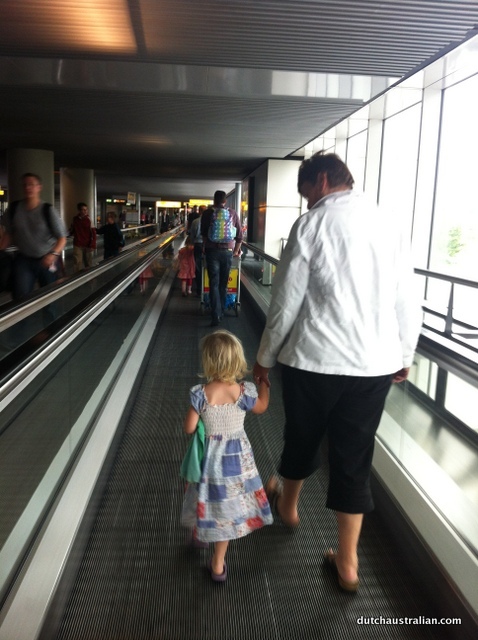 We got through customs quite quickly then it was a short wait for the baggage before we saw Bas’ family. Though if you’ve been to Schiphol, you know you can already see those waiting for you through the glass, so got to see our relatives from a distance at least while we were waiting. 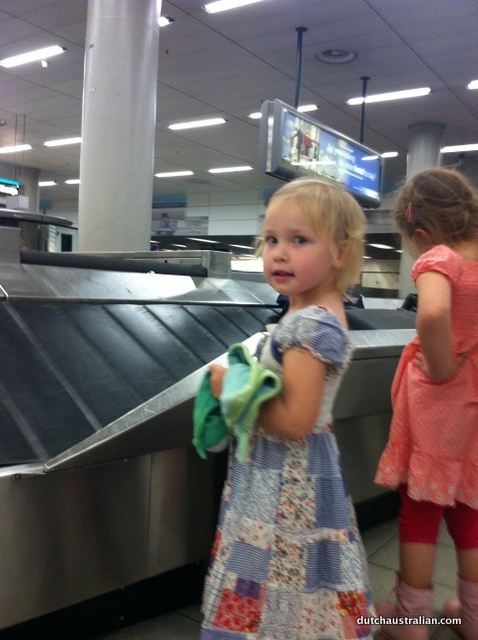 Not sure if I like that – it takes away the big drama of first glimpse when coming through the customs gate! Then the girls got to cuddle Oma and Opa and held hands on the walk to the car. I had to laugh and took this photo as a reminder – Isabella was super excited to see someone on a bike outside the airport and I wondered how long until that sight would no longer be a novelty! 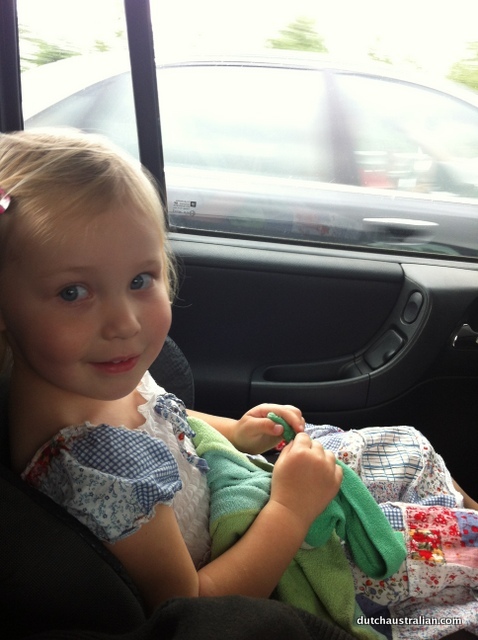 She also found it neat to be able to sit in a “big girl” seat in the car – by Australian law she had to sit in the “baby” seat until she was 4 but here she’s big enough to sit in the booster seat. 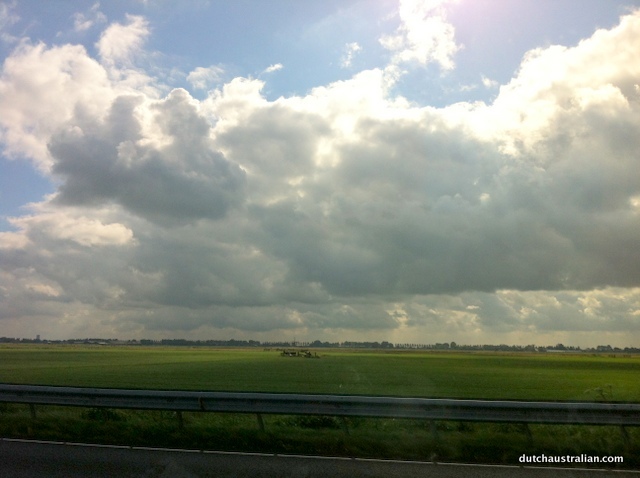 The scenery on the drive north was very typically Dutch – flat, green and organised with a sky that seems to go on forever. Much colder than I was expecting, seems I will need the warm clothes I bought from a Brisbane winter and not the summer ones. 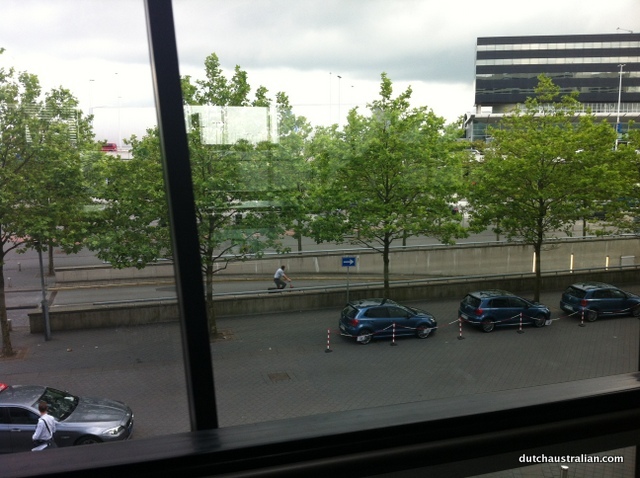 It’s been two years since I’ve been in The Netherlands. My husband was back last year for a visit, and his parents came to Australia every December/January for the 4.5 years we were living there. However I’d not seen my brothers and sisters-in-law for two years, or my nieces and nephews. They’d done a beautiful welcome sign for the girls. The house is where my husband was born and his father as well! It was lovely to see all the kids together as they are all a similar age. Bas has 2 brothers and 1 sister and the children are Anne (12), Jur (7), Madelief (5.5), Sophia (5), Pien (nearly 4), Hidde (3.5) and Isabella (3). 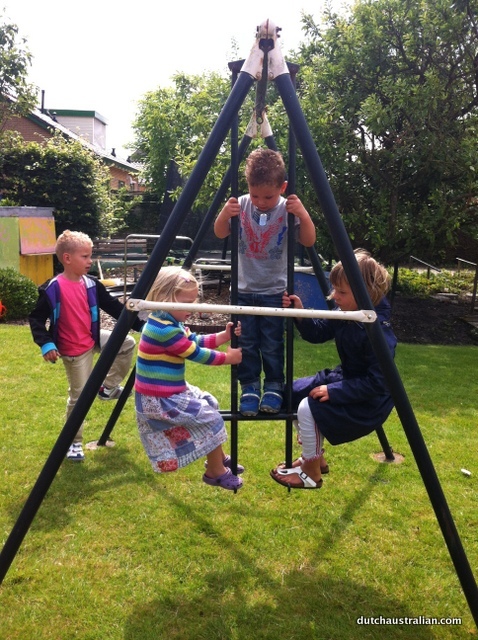 Here they are (minus Anne, Pien & Sophia) on the swing set Bas used to play with as a child! We’re staying with family for a few weeks until we find our feet. 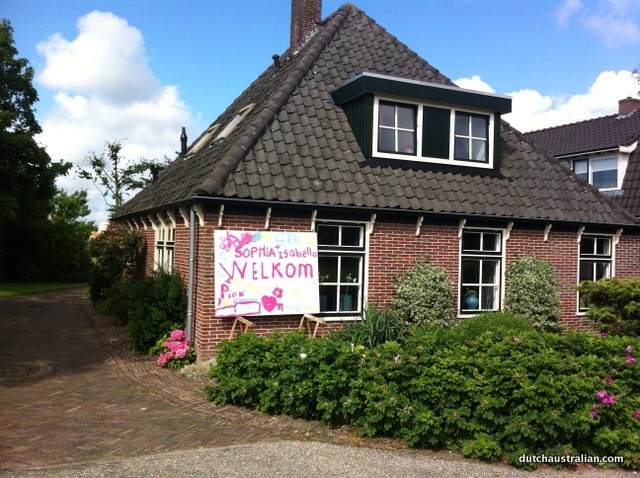 On arrival we had very Dutch morning tea – coffee and appeltaart! Lunch was bread, meat & cheese. This afternoon I went to sleep about 2pm…and didn’t wake until 1am. (Vaguely remember Bas trying to wake me for dinner and telling him to go away!). Awake for a few hours in the middle of the night then managed a few more hours sleep. The girls slept through quite well from around 8pm-7am. So we’ve made it to The Netherlands to begin our new life. My mother’s sister visited us 10 !!!! times, from Gouda. (Of the nine children, she and my mother had been the closest, when they were little.) I thought of her, when you wrote about the Dutch sky. I so remember Tante Juul commenting on Sydney’s sky, as we drove her home from the airport. She found it so ‘different’.